July 15, 2013, 10 a.m.
By Caroline O’Donovan @ceodonovan July 15, 2013, 10 a.m.
At the International Symposium on Online Journalism this year, SMU journalism professor Jake Batsell presented a paper on taking the idea of engagement out of the web browser and into the real world through events. Batsell had visited newsrooms all over the country because of an interest in finding alternative revenue streams in panels, parties, bar nights, quiz bowls, sports events, cook offs, and more. He’s currently wrapping up the manuscript of a book on the subject, Engaged Journalism: Rethinking News in an Era of Digitally Empowered Audiences. have a charge to travel the country and the globe, collecting, chronicling and disseminating juicy bits about all the innovative and impactful (and hopefully replicable) work going on…Jake knows more about who’s doing what in our fast-changing world than just about anyone we know. It will be a pleasure, not to mention enormously enlightening, to be a regular visitor to the new website he’ll curate as part of his fellowship. When I caught up with Jake, he was continuing his ongoing tour of newsrooms in London with the Telegraph. We chatted about monetizing niche news, getting out from behind the desk, experimentation in metrics and measurement, and a hoped-for esprit de corps when it comes to transparency in business. O’Donovan: Are you going to be spending most of your time in the Tribune newsroom or are you going to be doing the same kind of travelling you’ve been doing in your most recent research? Batsell: It’ll be kind of a mix of both. I will have a desk in the newsroom, I’m told. Part of my mission, as I understand, is certainly to travel to newsrooms around the country and kind of look for best practices to share and to put together a curricular resource for the industry to look at for guidance — especially for folks who are starting out to build nonprofit sites of their own. But part of my mission, too, I think, is to leverage the Tribune’s experience. The Tribune certainly hasn’t figured everything out, but they’re doing a lot of things right in the arena of nonprofit news — so I think really my mission is to immerse myself in the Tribune newsroom and culture and get a sense of how they’re doing things, but then to broaden the perspective a little bit and get out there to some of the Tribune’s peers, both nonprofit and for-profit, around the country and see what they’re doing that the Tribune isn’t. So I think the Tribune is looking to learn from this fellowship as well, and to have me as a window to some of what their peers are doing in the industry. Another thing is that the Tribune gets a lot of requests from, whether its students or researchers like myself or other nonprofit news organizations around the world, and they’ve never had a go-to resource. And it can be kind of a drain on their staffing — it takes away from the journalism that they’re doing. They enjoy and are very flattered by the attention and the requests for guidance that they get, but I think part of the mission is to — through a website, white papers, through other platforms — to put together a pragmatic, almost evergreen curriculum that when people call or they’re starting up their own news venture and they’re coming to the Tribune for advice. So the Tribune can first point them to this resource, and hopefully that will answer a lot of questions that folks have and be a one-stop-shop sort of place. O’Donovan: So it’s going to be taking the wisdom that the Tribune has stumbled upon in its early years and comparing that with what’s going on in the field? Batsell: Yes, absolutely, but really focused especially in a really pragmatic, business-oriented sustainability focus. Obviously, Nieman Lab does a lot of great work, CJR, Poynter, GigaOM — there’s a lot of operations out there that are covering the future of news. So we don’t want to replicate any of that with this fellowship. I think it’s to take a specific focus at the business side of things in a way that the Tribune can learn from and a lot of the news industry can learn from. So I’m going to certainly do my best to not replicate the great work of Nieman Lab and Ken Doctor. INMA does great things as well. I’m going to really try to make it as pragmatic as possible. How do you put on your first event? How do you handle a situation if a major donor becomes a major story? What are the different types of membership models that work? Really how-to, granular stuff from the Tribune’s perspective and what they’ve learned, but then branch out and go to some of the other interesting news experiments going on around the country and combining what I’ve learned at the Tribune with what I learned by visiting newsrooms for the past year or so working on this book. I’ve visited two dozen newsrooms. Now that I’m here in the U.K. — I visited the Telegraph on Tuesday — I’ve done over 100 interviews, and there are certain themes and best practices and common elements of audience engagement strategies that I’ve encountered in my visits to different newsrooms. So I really see the fellowship as a continuation of the research with the book. O’Donovan: It sounds like you’re aiming for something a little more prescriptive. Will there be a blog component, or are you really focusing on being more curricular? Batsell: I think we’ll figure more of that out once I actually start. I’m going to start in August sometime with a soft launch of the blog, probably in Tumblr form, with some of the things I’ve learned here in the U.K., and also explaining what the goal of the blog is going to be. And then, I think I’ll be simultaneously working on longer term things like white papers and more of the evergreen curriculum sort of thing that can be a standing resource. I do hope to build an audience. I think of the audience as certainly people in the industry who are working valiantly but sometimes get frustrated in terms of trying to figure out this equation. It’s not just about journalism anymore. You’ve got to figure out how to pay for that journalism in a much more direct way than you ever have before. That’s what I kind of see as my mission: looking at the business aspects of how to do online journalism right. O’Donovan: In a lot of your research for the book and what sounds like will also be a part of the new job, you write about the importance of face-to-face events, but you also yourself in researching them seem to put an emphasis on meeting these people face-to-face and spending physical time in the newsroom. Why is that important to your process? I was a reporter for The Dallas Morning News and The Seattle Times and there’s that whole adage of getting out from behind the desk or computer and doing shoe-leather reporting — you’re going to open yourself up to so much more by hitting the pavement. So I’ve done a few interviews via phone or other, but most of what I know comes from face to face interviews. I get more of a sense — you know, I’ll read about something and then I’ll go in there and experience it. One example was the open newsroom up in Torrington. So much was written about that. For the Digital First chains, they’re kind of a poster child for their reader engagement efforts, and I read about that and I had cited it in my own research. But when I actually went there, I came away with a much better understanding of what makes that place tick and how it’s evolved a little differently than when they first embarked on the experiment. I feel very fortunate to have received some travel grants from SMU and had a research sabbatical in the fall to visit some of these newsrooms. And they’ve been really supportive about this fellowship opportunity — to take a year of unpaid leave and come back in a year — as well. O’Donovan: It can be challenging to get that business-side information, for obvious logical reasons. Do you think that when you’re trying to do the same research as an employee of The Texas Tribune that it might be a little more difficult than as a researcher for an academic institution? Batsell: I hope not! I hope that there’s sort of an espirit de corps here — because this is under the auspices of the Knight Foundation and it’s something meant to benefit the industry at large — that most people would see the value in being as transparent as possible. The Tribune is an open book with it’s finances. Of course, they file the 990 forms that they’re required to, but Evan Smith and his T-Squared column does, if not quarterly, then very frequent updates about everything from finances to unique visitors. Coming to some of these organizations and being willing to share that information, I would think and hope that the places I visit are going to see the value in that and be forthcoming. But we’ll see. I’ve been a business reporter before. I’ve run up against business entities that didn’t want to disclose certain finances or proprietary information. I hope I’m not being overly optimistic. O’Donovan: In your travels, you’ve been mostly focusing on issues of engagement. I’m curious if there’s anywhere you’ve been that you’re excited to go back to and look at some other aspects of their models. Batsell: Let’s see. Geographically, I haven’t been to California at all. Been to Seattle, Las Vegas, Chicago, Michigan, the east coast from Boston down to D.C. Been to Austin, obviously, and throughout Texas. But California and Florida are two conspicuous places I have not visited yet. Thematically, I’ve broken my book research up into chapters, one of which is an extended version of the events paper I presented at ISOJ. But I’m also looking at the two-way conversation through social media, the idea of data interactives, gamifying the news. One thing I hope to dig deeper into thematically is niche journalism, in terms of a strategy for sustainability. Niches, whether it’s a political nonprofit like the Texas Tribune or GeekWire up in Seattle covering the Seattle tech community. Just assembling a passionate niche community — I wrote an article about The Dallas Morning News’ realtime high school football app. I think that there’s really things going on all across the board with respect to how to monetize niche audiences that are demographically desirable but also just really passionate about that subject. That’s something I’d like to dig even deeper into than I’ve been able to so far. And then, of course, the explosion of mobile. That’s something that’s been a challenge with the book: It’s growing and changing so fast, and there’s obviously a process of several months between when I turn in the manuscript and when the book comes out. So I think the blog and the fellowship will give me a chance to stay even further on top of trends in mobile and how to monetize mobile, because that’s very tricky. You know, the whole banner advertising model that’s worked to a certain degree on desktop and laptops doesn’t translate real well to mobile — and at the same time, there’s so much demand to mobile news. I don’t think it’s any secret that the news industry knows that and that they’re going after it, but just to really dig in and see not only how they’re serving the information needs of their community in a mobile form, but actually, you know, extracting revenue from that that feeds into the journalism. O’Donovan: I’m interested in the question of measurement of these strategies, or metrics around them outside of a direct connection to revenue. Is that something you’ll be focusing on — different ways of measuring success? Batsell: Yes, yes. Some of the newsrooms I visited are actually coming up with their own internal algorithm on how to measure that, and it depends — some folks look at unique visitors, some look at return visitors, some look at pagеs per visit, some look at pages per month. Sometimes it’s the frequency of visit, sometimes it’s the length, and then there’s other behaviors, too, when you factor in things like Facebook likes or retweets and that sort of thing. And then now, increasingly, I was just at the Telegraph and — I don’t want to steal too much thunder of a blog post that I’ll work on in the initial phases of the blog — but they introduced a paywall within the past year. So subscriptions are starting to be part of their metrics, as opposed to just sheer volume of pageviews. Now they’re taking a closer look at what motivates people to subscribe, and that’s becoming a more valuable metric in terms of measurement of engagement. O’Donovan: So data on what drives people to cross a paywall? Batsell: Exactly, because there’s a metered paywall that comes up at a certain point — what gets people to click through and subscribe? So yeah, measurements depend on the goals of the organization, but in visiting two dozen newsrooms, I’ve asked that question of everyone and I’ve probably gotten two dozen different answers in terms of how their newsrooms measure success. I know J-Lab did a report where they surveyed a lot of especially nonprofit news organizations who were screaming for help in measuring the effectiveness of engagement efforts. I don’t know that my book or this fellowship wil provide the ultimate panacea of answers to those questions, but it’s those questions that I really want to dig deeper and investigate. O’Donovan: When you distinguish between the fellowship and the book, what are the big differences? Is it along the lines of helping people with problems versus just presenting what you’ve learned as a whole? The book is meant to appeal not only to professionals but also to academics and students — to give a survey of the landscape but also some pragmatic useful tips that journalists can take away. But as I understand, the fellowship is gong to be much more targeted at the industry at large and much more pragmatic and news you can use. But I’m supposed to wrap up the manuscript of the book in August, before I’m full time in the beginning of September. O’Donovan: Sounds like there will be a temptation to just keep on writing, so best of luck with that. I’m curious if, in your travels, does that tension still exist, or is it lessening? Batsell: I think there’s a growing appreciation that revenue is…good for sustaining journalism. [laughs] But I do think there’s still — journalists, it’s been in our DNA, those of us who were trained in journalism schools up through the end of the 20th century, that journalists did their thing and the business side took care of itself. So I think there’s still a natural resistance sometimes, and I was among those at the time who weren’t really comfortable about taking a more direct role on the business side of things. I think with events that manifests itself a lot — if a news organization is going to do events, they have to really get buy in from the newsroom that this is important. Some reporters — most at the Tribune — are really on board with that, but I did encounter others in other newsrooms who weren’t real comfortable with it. They felt like it was kind of a marketing exercise and it wasn’t what they signed up for when they went to journalism school. That’s why news managers need to make the case to their reporters that there are ethical ways to be involved more directly in the business side without violating journalistic ethics — but still recognizing the value of good journalism and how it does really need to support itself and pay for itself in ways that it didn’t before. Because we don’t have the same advertising model that subsidized everything. So I’ve encountered growing acceptance of that, but I think there is still some aversion to it because so many people who go into journalism see it as a calling. They don’t do it for the financial reward, but for what’s satisfying to them professionally from doing it. So I’m seeing, I think, a growing appreciation for the need to be a bigger part of revenue generation, because obviously that pays for more journalism and pays for more newsroom jobs, and that’s something any journalist can support. O’Donovan: I spoke to Evan Smith yesterday, on an entirely separate topic, but we were talking about philanthropy and journalism and the best way to fund things, and he was making this point about what can be really helpful is when you have money for a project that goes on a little bit longer than many grants do. This is not meant to scare you, but you guys only have a year to accomplish what you’ve been tasked with, which isn’t a small task. How do you plan to make the best of your time? Were there someone to follow you, what do you hope to leave? Batsell: I do feel fortunate that I have a running start because of the book research, and that was one of my pitches in applying for the fellowship. But I would love to leave behind sort of a core, curricular resource that sums up the whole of my work during that one year, and then certainly the blog — we’ll present that story in small nuggets throughout my time, so that will be there. I just feel fortunate that this is very much in the wheelhouse of my research interests as a professor. I’ll be returning to SMU as an assistant professor of journalism and I’ll continue to dig deeper into this. So whether it’s under the auspices of the fellowship, or if the fellowship ignites that and I end up writing more articles for things like the ISOJ journal or academic journals or more books — although, oh boy, let’s finish the first one first — I think it will just really expose me to more ideas to just continue the research agenda that I have been pursuing for the last couple years anyway. I don’t get the sense — I know there will be a series of blog posts and white papers and some sort of summary document that chronicles everything I learn — but I certainly don’t think it will be the end of the story come fall 2014. O’Donovan: So when everyone in the industry is stable and profitable, you’re done? Photo by the UT Knight Center’s Lea Thompson. POSTED July 15, 2013, 10 a.m.
O'Donovan, Caroline. "Monday Q&A: Jake Batsell wants to build a guide on how to build a successful news nonprofit." Nieman Journalism Lab. Nieman Foundation for Journalism at Harvard, 15 Jul. 2013. Web. 25 Apr. 2019. O'Donovan, Caroline. 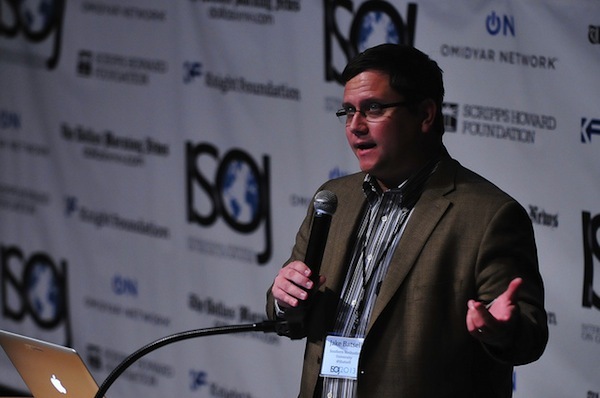 "Monday Q&A: Jake Batsell wants to build a guide on how to build a successful news nonprofit." Nieman Journalism Lab. Last modified July 15, 2013. Accessed April 25, 2019. https://www.niemanlab.org/2013/07/monday-qa-jake-batsell-wants-to-build-a-guide-on-how-to-build-a-successful-news-nonprofit/.